Gov. Andrew Cuomo flew to Puerto Rico on Sunday to launch an initiative that will recruit students and professionals to rebuild homes that were destroyed by Hurricane Maria last year. Around 500 student volunteers from SUNY and CUNY will team up with building professionals and Puerto Rico-based not-for-profits to aid reconstruction efforts on the island, Cuomo said in a press conference at John F. Kennedy International Airport ahead of his third trip since the hurricane. Half a million homes were damaged during the September catastrophe, and the crisis is ongoing, the governor said. “When we were there the morning after the Hurricane, we said this was going to be a long road," he said. "New Yorkers are going to walk with Puerto Rico every step of the way." 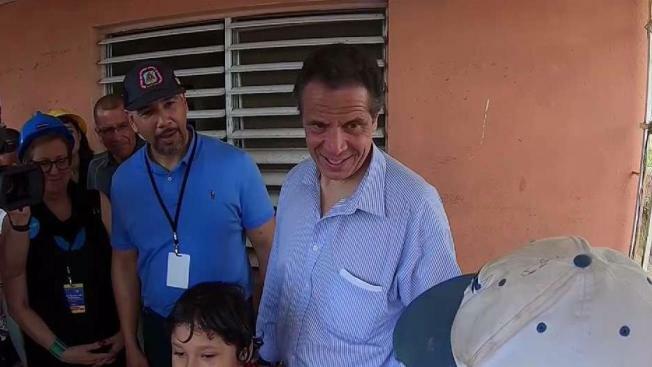 Upon his arrival, Cuomo took part in a round table with Puerto Rico's Governor Ricardo Rosselló, a bevy of local partners and his own “tactical assessment team” when he landed on the island, according to his office. He also toured homes in Toa Baja volunteers and workers are in the process of repairing homes that were flooded by the storm, his office said. “The problem there is that the people of Puerto Rico are not immigrants, they are American citizens… and I think that is a fact that has been lost on this federal administration,” he said.